Carl Linnaeus devised a binomial classification for plants and animals in the early eighteenth century and grouped animals and plants into increasingly inclusive hierarchical categories. However, he adopted the traditional Biblical teaching that all living beings were originally created in the form in which they now exist, so his classification was based on observable shared characteristics. But with Charles Darwin’s overwhelming evidence that living organisms evolved from common ancestors, some of which may be extinct, Linnaeus’s simple classification required reexamination. In 1866, Ernst Haeckel, a biologist and early Darwin supporter, introduced the term phylogeny to refer to the study of the evolutionary history of the species. To construct phylogenies, the discipline of systematics seeks to understand the evolutionary interrelationships of living organisms. In his 1950 book of the same name, the German biologist Willi Hennig introduced the concept of phylogenetic systematics, which attempts to identify the evolutionary relationship among extant and extinct organisms. Just as a family tree is used to trace ancestors from whom we are descended, the evolutionary history of a group of organisms can be represented by a branching diagram called a phylogenetic tree. This tree is depicted by a series of two-way branch points, with each branch point representing the divergence of two lineages from a common ancestor (for example, the most recent common ancestor of the coyote and gray wolf). The phylogenetic tree hypothesizes (but does not establish) these evolutionary linkages. Traditional phylogenetic analysis was based on external, observable characteristics that might be misleading. Advances in molecular biology have permitted the analysis of complex sequences of genes, chromosomes and even entire genomes. Comparisons of the DNA sequences of the various genes of different organisms have shown common ancestry that would not be obvious from physical likenesses. The amount of nucleotide sequences between a pair of genomes from different organisms indicates how long ago they had this common ancestor. SEE ALSO: Linnaean Classification of Species (1735), Darwin’s Theory of Natural Selection (1859), Ontogeny Recapitulates Phylogeny (1866), Domains of Life (1990), Human Genome Project (2003), Protist Taxonomy (2005), Oldest DNA and Human Evolution (2013). 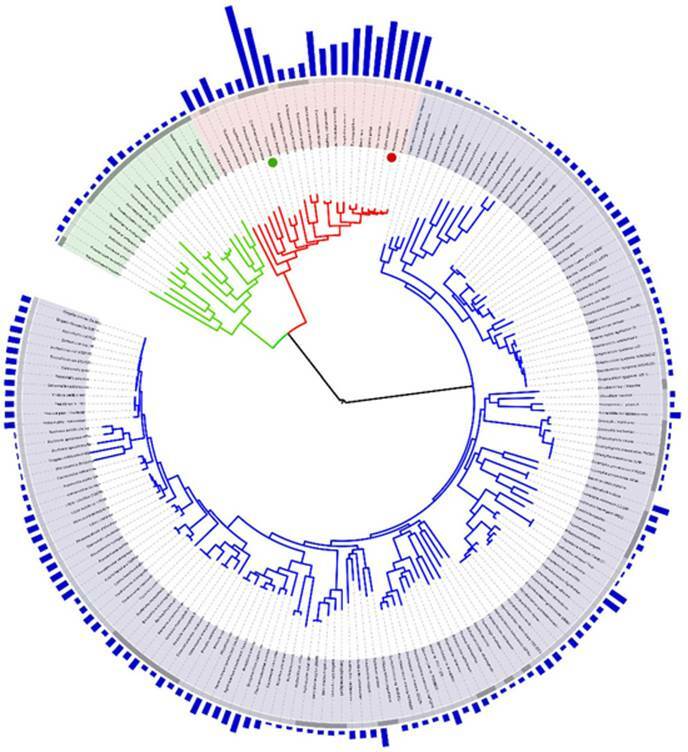 This image depicts a phylogenetic tree of life, with completely sequenced genomes divided according to the three domains of life: Archaea (green); Bacteria (blue); Eukarya (red), with the red dot denoting Homo sapiens.